Dean Batterham is one of more than 4000 people currently working on Bechtel’s three Curtis Island LNG construction projects. IF THE coal industry has slowed, the CSG and LNG sector is more than compensating, with major projects under construction in the Surat Basin gas fields and on Gladstone's Curtis Island. And that's sure to keep special class welder, Dean Batterham, very busy. Mr Batterham is one of more than 4000 people currently working on Bechtel's three Curtis Island LNG construction projects. Part of the tanks crew for about a year, Mr Batterham said the role was expanding his career horizons. "Working on this project has given me the opportunity to see how tanks are built and to work on the skills of my trade by learning to weld new materials," he said. Mr Batterham, 24, said the opportunity to learn and further develop his welding skills while working with an experienced team was the highlight of his job. He made the transition to Curtis Island after previously working for Bechtel on the construction of the Yarwun Alumina Refinery. "I've found Bechtel gives you the time to work on improving your skills and also encourages you to learn from the people around you. The transition wasn't too bad. I'm working with a great bunch of guys," he said. 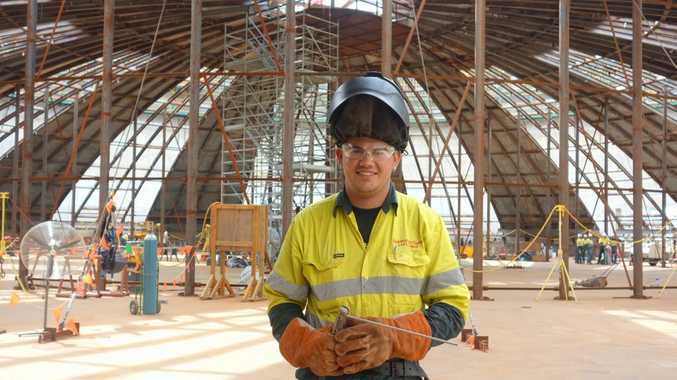 The long-term local got his first taste of construction as an apprentice boilermaker, a trade which he completed through Gladstone Area Group Apprentices Ltd in 2009. He says it is the satisfaction of seeing the end result that attracted him to a career in construction in the first place. "It's great to work on something and see the finished product at the end. I like being able to say, 'I built that'," Mr Batterham said. Bechtel is responsible for the construction of the three Curtis Island CSG to LNG liquefaction facilities, requiring a peak workforce of about 4000. The three projects - Santos's GLNG, QGC's Queensland Curtis LNG and APLNG, led by Origin and ConocoPhillips - will produce several million tonnes of LNG annually for export markets, using coal seam gas sourced in Queensland's Surat Basin, in the state's south-west. CSG companies are also undertaking investigative and early-stage development and exploratory work in traditional coal-mining regions of NSW.